Self Storage in Hull options by Monstermove UK. Self Storage is widely available, there are lots of storage facilities around but choosing the right one for you can be a challenge. Self storage in Hull facilities offer a wide range of options, storage container sizes, offers, promotions and more. But how do you sift through the gimmicks and find a self storage in Hull facility to suits you. Monstermove Self Storage Hull is a removal company operating from Kingston upon Hull in East Yorkshire. Although they do not actually offer a storage Hull service of their own, they can help and advise you on options, assist you in choosing a self storage facility and actually move your property in and out of the self storage in Hull facility. 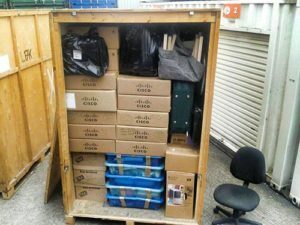 Offering an unbiased opinion and golden inside knowledge of all of the facilities within their area, you are guaranteed to find the ideal self storage in Hull facility to suit your needs. Having frequently visited all of the self storage Hull facilities, they can advise on the best facility for you. With so many options, insurance, 24 hour access, internal/external self storage containers and offers on long-term self storage Hull, they can help you with making the right choice to suit your needs. See our self storage page here. So whether you’re a business or residential customer. Contact Monstermove Removals Hull today.